With the winter chill behind us, springtime in central Arizona is the perfect time to plan an adventure in the vast beauty of the Sonoran Desert. This year, exploring the desert features not only ideal weather but a bursting display of wildflower blooms. The chance to spot birds, animals and other wildlife also increases, especially as desert reptiles emerge from their winter hibernation. Getting out into nature can be as traditional as a hike, but Arizona offers many other amazing ways to take in the beauty of our state. An invigorating hike is a great way to take in what the natural beauty of Arizona offers and hiking opportunities abound in the region. If you are new to hiking, starting on well-populated and easy to navigate trails is the way to go. Try exploring the McDowell Sonoran Preserve or the Phoenix Sonoran Desert each with hundreds of miles of trails to explore for all different skill levels. For a hike further afield, try a hike in the Boyce Thompson Arboretum, or plan a weekend trip to one of Arizona’s amazing national or state parks. When setting off by foot, desert safety is key to enjoying yourself. Always bring plenty of water and protect yourself from the sun. When your water is half gone, it means your hike should be at least halfway finished. 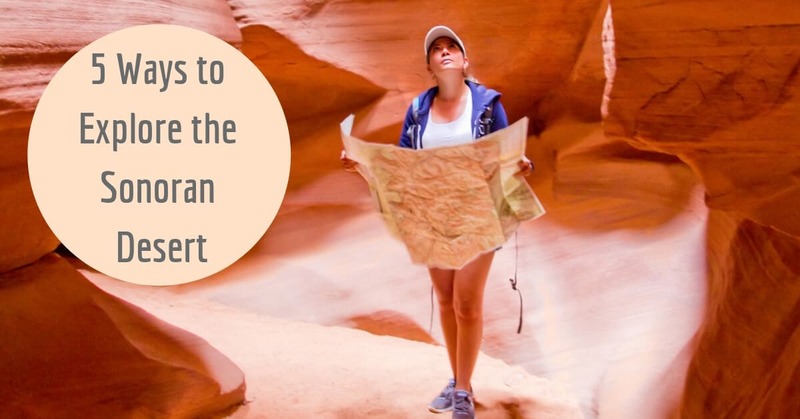 Hike safely and enjoy the beautiful desert. Horses have long been one of the best ways to navigate long stretches of desert. Here in the Phoenix area, guided horseback rides along beautiful trails are easily available and a memorable way to experience the great outdoors. Learning to ride a horse is a great activity for young people as well, and helps people with walking limitations access longer trails. Arizona isn’t known for plentiful water, but in Spring, many of our desert rivers offer their best opportunities for exploring by kayak or raft. Some of Arizona’s desert waterways run for just a short time with the spring and summer snow melt at their sources, so planning a water adventure in the Spring can show you seldom-seen routes unavailable the rest of the year. Beautiful lakes also dot the Sonoran Desert, many within an hour’s drive of the Phoenix area with beautiful and scenic fishing and recreation spots. If you’re new to the area, you don’t even need to leave the city to find a good fishing spot. Once you get your fishing license in order, try Alvord Lake or Papago Ponds in the city limits, or head out to the myriad of fishing lakes in the Tonto National Forest like Bartlett Lake or Saguaro Lake, stocked plentifully with a variety of fish for food or sport. Many trails and backroads in Arizona are best seen from behind the wheel of an off-road vehicle that can handle the desert’s rugged terrain. ORVs, including Jeeps and Tomcars deliver the durability, speed and high-clearance to get you down difficult roads and into some of the most tucked away areas of the desert. If you are new to exploring rough roads, start with ORV tours that can take you out and back safely. More seasoned desert explorers may enjoy renting or buying their own vehicle for fun and recreation out in the sun. For the truly adventurous, why not try a trip above the Sonoran Desert in a hot air balloon? Rising and dipping across the desert, a hot air balloon ride gives you a unique perspective on the rich terrain and sweeping landscape of the Sonoran region. No other way to see the desert measures up to the excitement and romance of a trip by hot air balloon. Hot air balloons rides give you the chance to see our beautiful land from above and culminate in gorgeous sunset views before a gentle descent back to land. Enjoying the desert year-round doesn’t have to be a trial. With CC Sunscreens, your home is protected from summer’s excess heat without bumping up your energy bills. CC Sunscreens help your home maintain a natural comfort so you can enjoy the Sonoran Desert any way you wish.